Its hard to believe that this is my 26th weekly post and that it is therefore half way through the entire year of 2011. I am enjoying these posts and they do help to encourage me to get into the shop each week in order to do a little bit of something. I look forward trying more new things with each project. As to what I did this week, we went to spend a few days with my wife’s family and they all seem to like a good puzzle. So after I got done packing on Friday I took a little time in the shop to make a very simple puzzle. No where close to fine woodworking mind you. But I did employ a technique I recently saw and have only played with. As you can see I embossed the lettering on the blocks. I did this by using a laser printed image of the directions and ironed them on. The trick of course is printing the image in mirror. Which I finally did in PowerPoint using WordArt. But I know I have done before just by selecting it as print option. For the life of me I can not remember how I did that. I’ll play with it some more but if anyone knows let me know. I took two of the four of these with me this weekend and let my brother-in-laws and the nieces and nephews play with them. I was nice enough to solve one before anyone got up this morning and left it on the table. Was quite fun watching them try to figure it out. For those of you not familiar with this it is very easy to find on the the web, just look for 9 nail balance. I made the stand by drilling a slightly larger hole for the 8 nails. To all of those celebrating have a safe and happy 4th of July and hope everyone gets to have some fun in the shop. 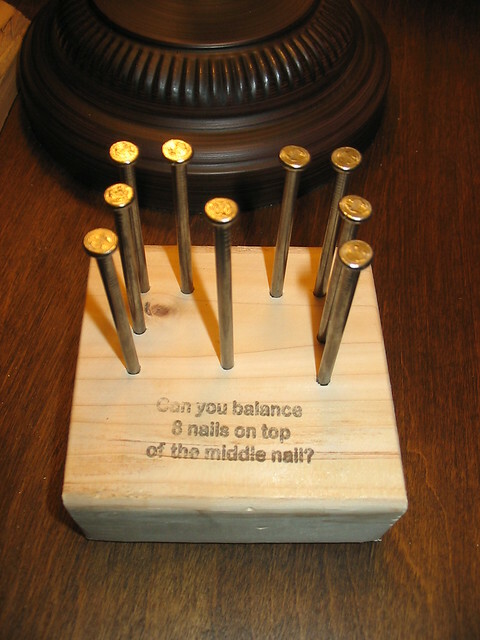 I’ll have to look up that nail balancer…does the trick involve a hammer? Get your page to print. On the preferences page select mirror print.